Where can I purchase an Army Flag? What do the designs on the Army Flag mean? Who designed the Army Flag? When was the Army Flag released to the public? How should I display my Army Flag with my American Flag? The best place to purchase an Army Flag that is also 100% made in the U.S. A. is Star Spangled Flags. 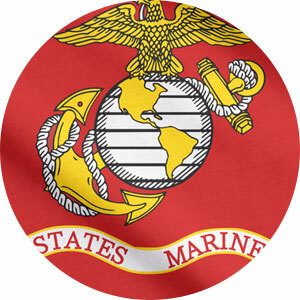 The flag is made of a heavyweight nylon which makes it strong and long-lasting. It has two rows of lock stitching and four rows of lock stitching on the fly end which prevents unraveling and fraying adding to its’ longevity. It is also treated to dry fast and resist sun and chemical deterioration keeping the colors strong against ultraviolet rays in the bright sunshine. 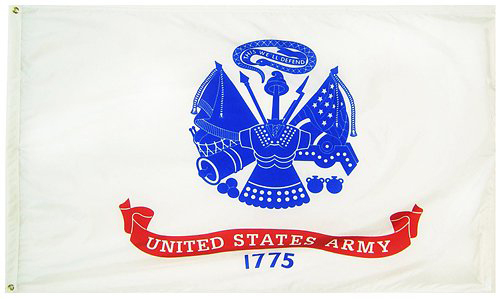 The official Army flag consists of a white field with a blue symbol and red ribbon that reads, “United States Army.” Below that, the year 1775 is written in blue, which denotes the beginning of the Army. 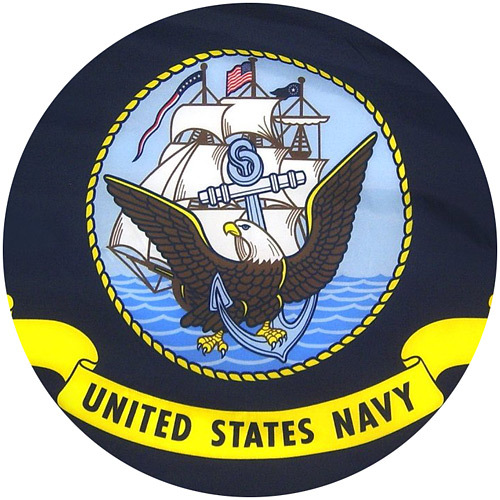 The blue insignia that takes up most of the flag is the central design of the original War Office seal. It depicts a roman cuirass (in the middle) which represents defense and strength. Other common Army weapon such as a sword, esponton, musket, cannon, and motor bombs are also present. The drum and drum sticks represent public notification and the Army’s role to serve and protect the nation. The Phrygian Cap within the symbol that is supported by the sword, also has the motto, “This we’ll defend,” written on a scroll coiled around a rattlesnake. The Army flag of the U.S. was designed by the Heraldic Branch, Office of Research and Engineering, Office of The Quartermaster General. 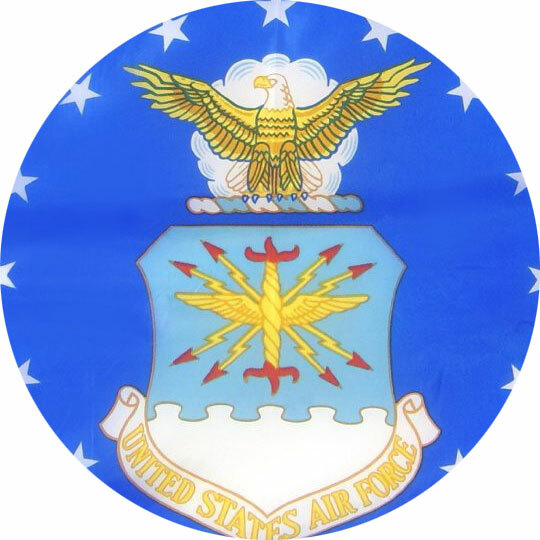 Research on background material was begun in July 1955 when a requirement for a United States Army flag was indicated by the Secretary of the Army. Several tentative designs were developed and from among these, the design as adopted was selected by Secretary of the War Wilber M. Brucker. The U. S. Army Flag was adopted by President Dwight Eisenhower in June 1956, but prior to this the Army didn’t have a flag to represent the entire service. The Army Flag was dedicated and unfurled to the general American public on June 14th (Flag Day!) at Independence Hall in Philadelphia. That day also marked the 181st anniversary of the establishment of the Army by the Continental Congress in 1775. If you are flying the Army and American flags on the same pole, the American flag should be on the top and larger than the Army flag. If you are flying them on different poles, the American Flag should be on the observer’s left and the Army Flag to the observer’s right. Please remember when flying your flags at night they should be illuminated. Please be sure to choose all-weather flags for outdoor use. The flag of the US Army is set on a white field, and displays a blue replica of the War Office Seal in the middle. 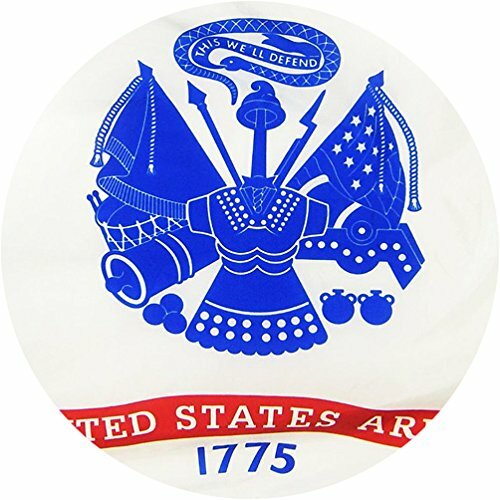 A broad scarlet scroll is placed under the seal with the text “United States Army” in white letters, and in blue arabic numbers beneath the scroll reads “1775”. 1775 is the year the Continental Army was established, and the Commander-in-chief appointed was Gen. George Washington. The flag was officially adopted by the Pres. Dwight Eisenhower on June 1956, but prior to this the US Army didn’t have a flag to represent the entire service. 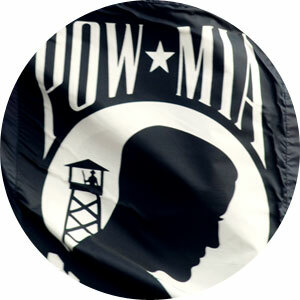 The flag was unfurled to the general public on June 14, 1956. It was the 181st anniversary of the establishment of the U.S. Army by the Continental Congress held at Independence Hall, Philadelphia.